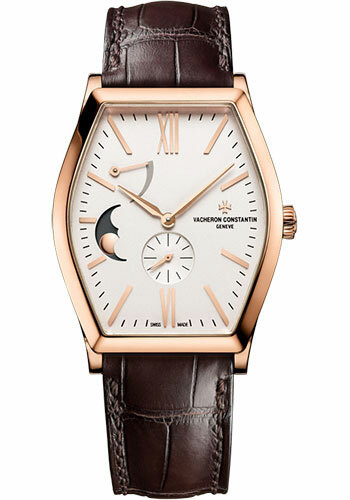 36.70 x 48.10 18K 5N pink gold case, 10.49 mm thick, solid back, white dial, Caliber 1410 AS manual-winding movement with hours, minutes, power reserve, small seconds at 6 o'clock, precision moon phase, approximately 40 hours of power reserve, dark brown alligator Mississippiensis strap, 18K 5N pink gold ardillon buckle. Water resistant to 3 bar. delivered with a corrector pen. 39mm x 49mm 18K white gold case, silvered dial with Clou de Paris hand-guilloche center, manual-winding 1410 AS movement with hours, minutes, small second, moon phases, and power-reserve indications, approximately 40 hours of power reserve, Mississippi alligator strap with folding buckle. Water resistant to 30 meters. 39mm x 49mm 18K 5N pink gold case, silvered dial with Clou de Paris hand-guilloche center, manual-winding 1410 AS movement with hours, minutes, small second, moon phases, and power-reserve indications, approximately 40 hours of power reserve, Mississippi alligator strap with folding buckle. Water resistant to 30 meters.